Would you like it if this was your pet? No one should have exotic animals as pets! The number of animal deaths are at 200. The injures are at 55. The injures for us are at 543. The deaths are at 75. Will you rethink having an exotic pets now? Lets use the example of big cats. With them out of the environment, the cats prey population will skyrocket. The environment's ecosystem will be completely out of balance. Another problem is that when people buy them, they realize they don't have the proper care. Then they release them back into the wild. What happens is now the animals carry diseases back to their habitat> It could wipe out some of the animals. In Zanesville, Ohio, Terry Thompson had many exotic pets on his property that he shared with his wife. Many of the animals went out of control. Terry killed himself. Then all the animals broke out of there cages. People then called the police. The police had to get several Bengal Tigers, monkeys, lions, wolves, baboons, and even more exotic animals under control. The police shot 50 of the animals trying to retain peace at Thompson's house. In Allentown, Pennsylvania, the Walz family thought that naming a 350-pound bear "Teddy" would mean that it forgot all it's natural instincts. They found out he didn't when he attacked and killed 37-year-old Kelly Ann Walz. This happened while she was cleaning his cage while he was loose. They kept Teddy on one side of the cage while the other side was cleaned. The bear was shot and killed while it was on Kelly Ann. These stories show that is why humans shouldn't keep exotic pets. We can pick up many diseases from many of these animals. Some diseases that can be transferred are rabies, measles, monkeypox, giardia, and tuberculosis. 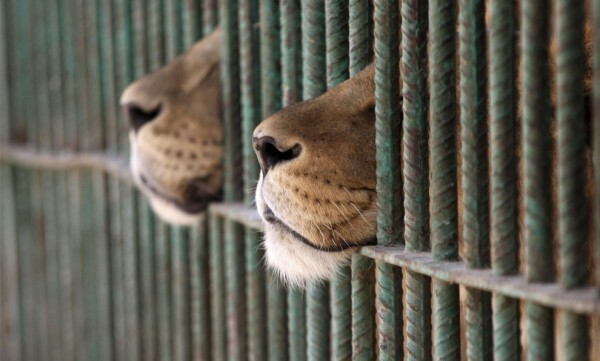 Some dangers for animals are that they don't get the proper care they need to survive in captivity. When the claws or teeth are removed from the animals (yes, the owners actually do that), that causes serious pain to them. They aren't exactly harmless after that either. Some animals can travel a mile each day. They need more exercise than a walk around the park. The Wildcat Sanctuary has issued the "Big Cats and Public Safety Act" to help the big cats in captivity all over America. Once this bill is issued, all big cats will have to be registered with the USDA. Once this is released as a law, it will be illegal to breed any big cat unless at a credited AZA zoos where breeding will be for conservation purposes only. People who violate this law will have their animals taken away. Anything that was used to help this activity will also be confiscated. These people could face a fine of $20,000 per animal and up to 5 years in prison. "National Geographic Society." Nat Geo Wild. N.p., n.d. Web. 6 Feb. 2014. <http://channel.nationalgeographic.com/wild/animal-intervention/interactives/exotic-animal-incidents/>. "Exotic Pets "What the Experts Say"."YouTube. YouTube, 12 Nov. 2009. Web. 6 Feb. 2014. <http://www.youtube.com/watch?v=07WTrPdoLPg>. "Exotic Animals as Pets." ASPCA. N.p., n.d. Web. 6 Feb. 2014. <http://www.aspca.org/adopt/adoption-tips/exotic-animals-pets>. "6 Tragic Stories of Exotic Pet Ownership Gone Wrong." TreeHugger. N.p., n.d. Web. 10 Feb. 2014. <http://www.treehugger.com/endangered-species/6-tragic-stories-exotic-pet-ownership-gone-wrong.html>. "Exotic Animals as Pets." ASPCA. N.p., n.d. Web. 9 Feb. 2014. <http://www.aspca.org/adopt/adoption-tips/exotic-animals-pets>. "Federal laws governing private ownership and breeding of wild animals | The Wildcat Sanctuary." Federal laws governing private ownership and breeding of wild animals | The Wildcat Sanctuary. N.p., n.d. Web. 10 Feb. 2014. <http://www.wildcatsanctuary.org/federal-laws/>. "Celebrate World Animal Day in the Spirit of St Francis." Cat Lifestyle Mousebreath Magazine. N.p., n.d. Web. 11 Feb. 2014. <http://mousebreath.com/2011/10/celebrate-world-animal-day-spirit-st-francis/>.